Though the Niall of the Far Travels series consists of ten short stories, I own only nine of them. The eighth installment, which comes between "The Cup of the Golden Death" and today's entry, is entitled "Out of the Eons" and appeared in the premier issue (August 1980) of a TSR periodical not many people remember, Dragontales. 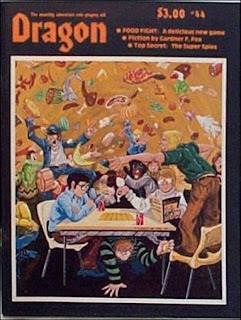 Dragontales was an anthology of short fiction that, so far as I know, did not last more than a couple of issues. I remember seeing copies of it in bookstores and hobby shops in the early '80s, but I never picked one up for myself. Consequently, I won't be discussing "Out of the Eons" here, though I will be making an effort to try and find a copy at some point in the future. It was no more than a foot high, and had obviously been carved by a master craftsman. It showed something amorphous, almost shapeless, yet possessed of some strange, other-worldly power. Its rounded eyes seemed to peer upwards at Niall, as though promising him untold wealth and power even as a tiny voice whispered soothingly inside his brain. Niall growled under his breath. He did not like these mysterious manifestations of the many gods that infested his world. Despite his distaste for anything having to do with the gods, Niall decides to hold on to the idol, which he reckons to be solid gold. He takes it back with him to his palace in the city and, before he reaches it, he is set upon by a beautiful young woman. The woman, who identifies herself as Thayya, begs Niall to give her the statue: "Come with me and you shall be rewarded," she says. The northern warrior senses a trap -- indeed, he hopes it is a trap, as he's in the mood for adventure -- but nevertheless agrees to come with Thayya. Niall's instincts are correct. Though the young woman tries to ply him with gold and other enticements in exchange for the statue, when he falls prey to neither, she calls on assassins to try and slay him. Niall bellowed with delight. His great sword came up into his hand and he swung it like a scythe. A head toppled from a neck, and then Blood-drinker was burying its keen blade into a shoulder, half severing it. The Far Traveler moved like a cat. He was half across the room even as he was freeing his blade from bleeding flesh, lifting it to swing again, and then again. At each stroke of that shining steel, blood spurted. Heads were cloven, arms were sheared. Only now and again did he use his blade as a shield to deflect the blows that were aimed at him. Niall was in his glory, with the ring of steel in his ears and the sight of armed men coming at him. For this he had been born, to fight—and to fight even harder against such odds. He heard Thayya urging on the men amid whispered prayers to whatever gods she worshipped. She was backing slowly toward the door, eyes big with terror, as she saw how Niall fought. Niall wanted to reach her, to take her with him to answer questions. But the mercenaries who fought him seemed to detect what it was he wanted. They flung themselves before him; they gave up their lives to protect the woman. Thayya moved toward the doorway and slipped through it, closing and bolting the door behind her. Niall growled low in his throat, hurled himself even more savagely at the men who still faced him. They went down before his blade until he was the only thing standing in the room. As the last man fell, Niall shook himself and lowered his sword. He moved toward the thick door that blocked the path deeper into the building. It was barred, bolted. Niall shrugged. The woman was long gone. Needless to say, Niall decides to find out more about both the golden statue and Thayya, a quest that takes him not just far away from Urgrik but involves him in the machinations of the very gods themselves. Ultimately, that's what makes "The Lure of the Golden Godling" such a compelling read. Gardner Fox does a lot to flesh out the gods of Niall's world -- their relationships, their petty feuds and jealousies, their need for human worshipers -- and this goes a long way, I think, it distinguishing this series from others of its kind. There's good reason Niall wishes to avoid having anything to do with the gods and "The Lure of the Golden Godling" makes the reader see the wisdom in his stance. It's a fun story and a very gameable one, too, something that a great many tales of gods and men are not -- another point in its favor. The titles in this series are a real mixed bag. I love the vibe in the phrase 'Out of the Eons' - almost as much as 'Out of the Aeons' - and 'The Cube from Beyond' is gloriously weird; 'The Eyes of Mavis Deval' is way out there. On the other hand, 'The Thing from the Tomb' feels rather banal, as do 'The Stolen Sacrifice' and 'Shadow of a Demon' on balance. 'Beyond the Wizard Fog' just feels clumsy, although I do want to know much more about what's going on and it does get the imagination working. The snippets of text you're posting aren't encouraging me personally to pick any of these up, but like many such series, I think the magic is in the potential and the scope more than anything else. In that sense I'm very interested, and I'm finding these brief reviews subtly inspirational. Not related to this, but I noticed your interview was up over at Penny Red. http://www.hazardgaming.com/preps.html#ep12. I was last week's. First comment, but I've been reading (and enjoying) the blog for a while. As it happens I've got that Dragontales with "Out of the Eons" in it. If you want to read/review that story, I'd be happy to scan & email it to you. First comment, though I've been reading (and enjoying) the blog for some time. 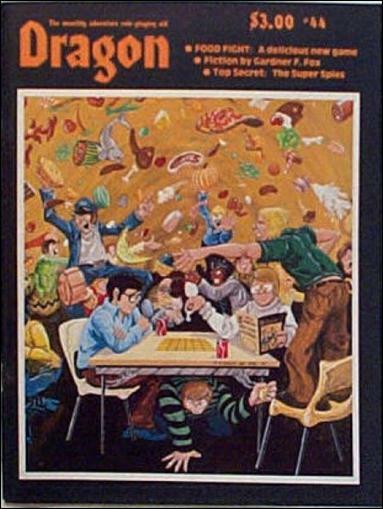 As it happens, I've got that issue of Dragontales sitting on my bookshelf. If you're interested in reading/reviewing that story, I'd be happy to scan it and email it to you. How appropriate for a D&D magazine. "Do you really think this isn't a trap?" "No, but it's the hook for tonight's adventure and there's sure to be XPs at the other end."